Having provided regular musical performances in Sunderland for the last 70 years since it held its first concert in March 1949, Bishopwearmouth Choral Society is celebrating its 70th Anniversary season with a reprise of that initial concert, Haydn’s Creation. 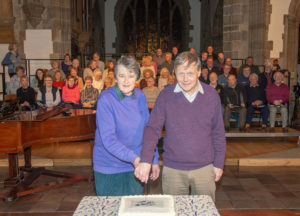 For such a significant birthday there had to be a cake and this was shared at their last rehearsal before the concert after being cut by Christine Alder, Society Chairman, and David Murray, the Society’s Musical Director. This entry was posted on Saturday, March 30th, 2019 at 9:05 am	and is filed under News.